I'm not a big fan of Valentine's Day but it is coming up real soon and I know at least some of you are scrambling to find just the right gift for your sweetheart. Forget about the expensive, gaudy heart-shaped boxes filled with horrendous chocolate from the drugstore. That and flowers from the corner bodega really just seem like an afterthought. 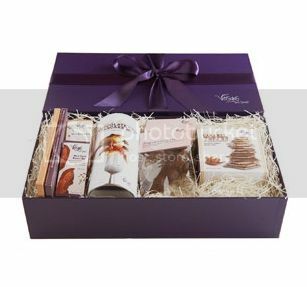 Not so with Vosges Bacon + Chocolate Gift Box. This is a real gift and it's awesome for both men and women. 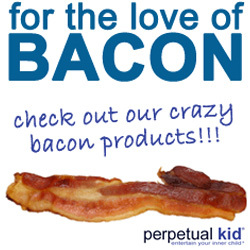 It includes a 3 oz Mo's Bacon Bar, 3 oz Mo's Dark Bacon Bar, Mini Mo's Bacon Bar, Mini Mo's Dark Bacon Bar, 2 Flying Chocolate Pigs filled with bacon, ¼ lb Bacon Caramel Toffee and Mo's Bacon + Chocolate Pancake Mix. How much more romantic can you get?